Eight pencil studies by Irish artist Eve Parnell, inspired by the sculptures by Gian Lorenzo Bernini in Rome were exhibited at the Irish College during the month of September 2013. Eve’s monochromes focus on and savour the detail of Bernini’s works. 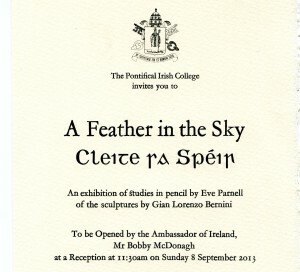 The opening of the exhibition took place at the Pontifical Irish College, Rome, on Sunday 8th September 2013 at 11.30am. The exhibition was opened by the Irish Ambassador to Italy, Mr Bobby McDonagh. During the course of the exhibition, prizes donated by sponsors of the exhibition were raffled and proceeds will go to the Community of Sant’Egidio, working with the poor of Rome and for peace in the world.